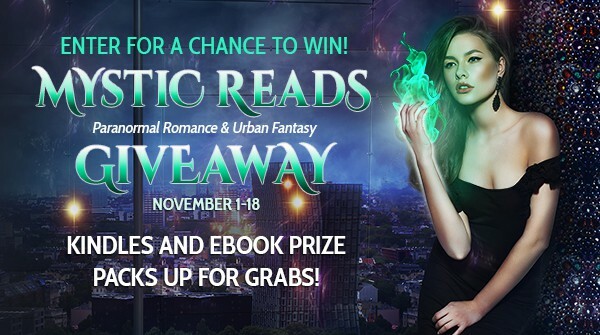 I'm participating in the Mystic Reads PNR/UF Lovers Giveaway running November 1 - 18. Enter for your chance to win and choose your own prizes! Which paranormal romance or urban fantasy authors are your favorites? Which new books have you been waiting to buy? Enter our giveaway from November 1-18 and you could be one of 7 lucking winners to choose the book prizes you want! Plus two winners will also take home a Kindle! And while you’re at it, shop our awesome book fair with 38 fantastic PNR/UF titles, many FREE, but none priced above $2.99!